Astro Jyotish - Service Provider of numerology services, tarot services & palmistry services in New Delhi, Delhi. Numerology is the study of the occult meanings of numbers and their influence on human life. Numerology is a complex arithmetic system that reveals your character, personality, and experience through the reasonable progression of numbers. Numerology provides a complete personality lifestyle profile when we apply the meaning of individual numbers to our birth name and birth date. Your name and your birth date are the data base from which a numerologist is able to describe you, sight unseen. Number values are assigned to the letters in your name. By adding these--with the numbers in your birth date-in a multitude of combinations, a numerologist establishes your key numbers. He then interprets the meaning of these key numbers, which results in a complete description of your personal characteristics. There are two most popular methods of numerology are Pythagorean and Chaldean. Though each is a different system, with distinct differences, they both are in agreement on certain things. Letters converted using nos. 1 to 9, Started about 600 BC, Sometimes called Modern Numerology, More popular because easier to use, Gives a more materialistic meaning, Uses full name given at birth, Conversion is done in sequence, Pythagoras a mathematician used it, All compound numbers reduce to single numbers. There are many types of fortune-telling cards on the market these days, but not all of them are Tarot cards. The Tarot is a specialized set of cards that has a very long history. Some have even claimed that they derive from the ancient Egyptian civilization, but I think it more likely that they are European in origin and date from various mystical traditions some time around the period of the Crusades. 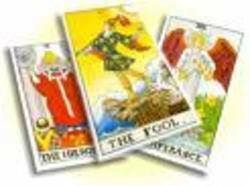 A Tarot deck is similar to an ordinary pack of Playing cards. Both have four suits numbered from ace to ten. In a Tarot deck these are known as the Minor Arcana, and instead of Clubs, Hearts, Spades and Diamonds, the Tarot suits are Wands, Cups, Swords and Pentacles. Unlike an ordinary Pack of cards, each suit has four court cards rather than three: King, Queen, Knight and Page, making fifty-six cards in the Minor Arcana. In addition to the Minor cards, the Tarot deck has twenty-two 'extra', cards known as the Major Arcana. These do not belong to any suit, but have their own numbers (with the exception of the Fool), a symbolic image and a title. If, when doing a reading, more Minor cards occur than Major, then your destiny is mostly in your hands. If it is the other way around, fate governs Your future. The following sections of the site deal with the meanings of individual cards, as well as possible combinations and how to lay then out to create a reading. Each interpretations divided into upright and reversed meanings showing the Positive and negative effects of the cards. However, it is Permissible to use only the upright interpretations if you think that the reversed ones are too hard for the beginner. PALMISTRY is the process of foretelling ones future by the imprints on the palm. 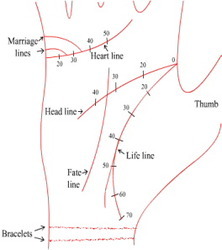 Palmistry is based upon the interpretation of the general characteristics of one's hands, together with the study of the lines, their patterns and other formations, which appear on the palms and fingers. Although the general nature of one's hands does not change, the lines, patterns and formations often do. Palmistry may relate to the physical state, emotional, mental and health condition, tendencies and modes of interaction with others. Palmistry is in itself a complete science which can forecast the future of an individual authentically. In the present day modern world, it would be very helpful for a person if his future is known. It would be easier for him to reach his destined destination. For this purpose we need an authentic science which can tell the complete past and to fore- see. Palmistry is an important science which tells us about the future very genuinely. Of, course there are the various branches of Astrology which predict the future course of an individual , but palmistry gets one step more in it the results are very clear and accurate. In the other branches of Astrology, the moment of birth is very important but in Palmistry, it is the lines and mounts on one's hand that hold the key to his future. Gemstone are the remedial solution provided to human being to give strength to the weak or problematic aspect related to a weak house and to make things fairer for the strong aspects of life related to strong houses of the horoscope and to increase the strength of benefic planets . Most of the astrologers follow the same age old principles of recommending the Gem Stones which represent the Ascendant (rising sign), the Fifth lord, the Ninth lord or the Moon sign lord, and avoiding the gem stones for the planets who are the lord of the 6th, 8th and the 12th lord. This is why most of the time people do not get any positive effects. Our expert astrologer can analyze your Vedic horoscope and on the basis of astrological analysis, astrologer will prescribe you the gemstone which will boost your luck, prosperity, property, mental peace, happiness, business, career, education, marriage and love relationship. Apart from the type of gemstone, the weight of stone, the metal in which it should be mounted is also a very important aspect, because overweight cause an overload while too little will not act all. We will also determine the most suited Time, Day, Date and other wearing Instructions for the Gem Stone, in order to get what you desire from it along with the Mantra for wearing to keep it pure as well as energized over a period of time. The Life Astrology Prediction Report is prepared after the exhaustive analysis of your horoscope. The Life Prediction Report will cover the main aspects of your life such as Love, Romance, Marriage, Children, Money, Sale and Purchase of Vehicle/Property, Career, Foreign Travel, curses, Health and anything else you can think of. You will get a Complete and unaltered review of your Horoscope for total Peace of mind and Happiness. It will help you to discover your strengths and weakness, or discover the potential for development and growth in your self. Your horoscope is made with the help of numerous calculations. The complete twelve houses and the planets are analyzed. Your Birth Ascendant, Sun Sign, Moon Sign and 'Nakshatra', according to Vedic Astrology are determined. Complete Horoscope Charts with most accurate and specific calculations, including Birth Chart, Moon Chart, 'Navamsa' & 'Bhava' Charts, ‘Sudershan Chakra’, ‘Shodashvarga Summary’, ‘Graha And BhavaBala’ are used. The horoscope (Natal chart ) is analyzed for its strengths, weakness, characteristics and events. The events are timed with the help of Vimshotari Dasha ( planetary periods). Right utilization of such energies gives us pleasure peace, prosperity and money etc in our life. Now a days we are having National Building code, which gives us certain regulations to construct building, whereas in past our ancestors were having Vastu Shastra as a religious & rigourics code. As per Shastra Vastu Purush is God of building science, hence let us pray. Hey Vastu Dev ! Saluting. You always lies on earth and fulfills our houses with happiness and property, as Meru hills are place for all gods, you bless us that all gods including Brahma stays at my house statically. When all the planets are hemmed between Rahu and Ketu i.e., the moon's north node and the moon's south node Kalsarpa Yoga is formed. Complete Kal Sarpa yoga is formed only when half of the chart is unoccupied by planets. Even if one planet is outside the Rahu Ketu Axis there is no Kalsarpa Yoga. Panchang is a sanskrit name. Indian astrologers do astrological calculations with help of Panchang. The Panchang which is given in this site is based on IST (GMT + 05:30:00). The calculations which were done in horoscope are based on these traditional principals of Vedic Astrology. The panchang given here is used by most of the astrologers and people in day to day life to calculate the right Mahurat. It is not possible to give complete panchang through software on internet and in case you require something, kindly contact our astrologer for any query. difference of fast revolving Moon from Sun becomes 12 Degree (Ansh) that is the end of Pratipada and start of Dwitiya.Besides this, please get information of all the tithies with the stages of Moon revolving around the Earth. TITHI VRIDHI ( Addition) : The tithi which is present at the time of Sunrise on first day and also on the second day sunrise is called Tithi Vridhi. TITHI KSHAYA ( Delectin ) : The tithi which starts after first sunrise and ends before second sun rise is called Tithi Kshaya. DAYS: The time between first sunrise to next sunrise is called a day : Sunday, Monday, Tuesday, Wednesday, Thursday, Friday & Saturday are 7 days of the week. Variyaan, Parigh, Shiv, Sidh, Sadhya, Shubh, Shukla, Brahm, Ainder, Vaidhriti. There are twelve signs of the zodiac. One of the signs happens to be the sign rising at the eastern horizon at the time of birth. This rising sign is called the lagan or the ascendant. The lagan happens to be the first house of the horoscope. By this is meant that the houses and signs do not coincide. The first house has the label of the sign rising at the time of birth; the second bears the label of the sign that will rise next, and so on. According to the rules of Astrology, an able astrologer can tell about the Life, longevity, health, natural tendencies, body, vitality, sorrows, gain, wealth, name, honor, dignity, fame, pleasures and sickness of the native. If the ascendant is afflicted with malefic planets, there will be injury or any other affliction to Head, face, brain, nerves, facial bones, upper jaw and pituitary glands. Astrology provide a outlook when we are going to face bad or good consequences of our Karmas (past deeds). Many people ask me what are the remedies and how can we avoid bad things in life. I will provide you better remedies which will sure help in reducing the malefic influences of planets affecting your life. Each of the above has its own significance and have their own number of points. These all add up to 36 and a score below 18 is not considered a good match according to traditional astrology. We are providing you a free utility to match the astrological charts of boy and a girl for the purpose of marriage through traditional method of Kundli Milan (Gun Milan). 1. Kundali Milan (Horoscope Matching) is a unique and ancient 8-fold Vedic test of horoscope matching between a man and woman's charts for marriage. 2. Another very important aspect of Marriage Compatibility is Manglik Match (Mars Consideration). Which is very important for success of married life and well being of both male and Female partner.